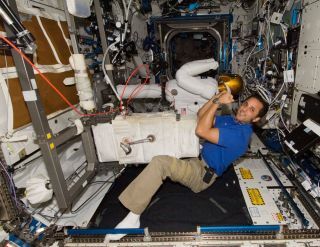 NASA astronaut Joe Acaba, Expedition 31 flight engineer, poses for a photo with Robonaut 2 humanoid robot in the Destiny laboratory of the International Space Station in June 2012. While people across the United States mark their country's Independence Day on July 4, one American will have to miss out. In space, it turns out, there's no fireworks allowed. American astronaut Joe Acaba won't shoot off any fireworks for the Fourth of July because he lives on the International Space Station where uncontrolled fire of any kind is strictly prohibited. It's unlikely Acaba will be able to see any Independence Day fireworks on Earth from his vantage point in orbit. The International Space Station circles the Earth in an orbit about 250 miles (400 kilometers) above the surface. It streaks through space at a speed of about 17,500 mph and completes one orbit every 90 minutes. While astronauts can see many natural events and human-built structures on the Earth's surface, including spectacular city lights at night, ships on the oceans and the pyramids of Egypt, the annual fireworks displays across the United States aren't on that list, NASA officials say. In the past, space station astronauts have tried to spot some of the country's largest Fourth of July fireworks displays to no avail, NASA spokesman Kelly Humphries told SPACE.com. But that doesn't mean Acaba will have to skip all of his American Fourth of July traditions.Like many Americans, Acaba has the day off on July 4 to use as he sees fit. And he may not be completely without a fiery display. This series of images shows an example of fires burning in a special zero gravity chamber as part of an experiment for the International Space Station. Image posted July 3, 2012. Acaba, who was a high school teacher before joining NASA's astronaut corps, has been spending this week working on an experiment to see how fire behaves on spacecraft. He has been recording video of fires in zero gravity using a special combustion chamber on the space station. The experiment, called the Burning and Suppression of Solids, studies how things burn and are extinguished under the weightless conditions of spaceflight. Scientists hope the experiment will help develop better ways to put out accidental fires aboard spacecraft in emergencies. Acaba has lived aboard the space station since May and is one of three crewmembers of the Expedition 32 mission. His two crewmates are cosmonauts with Russia's Federal Space Agency. The Expedition 32 crew bid farewell to three crewmates earlier this week (they landed on July 1) and is preparing for the arrival of three new crewmembers later this month.